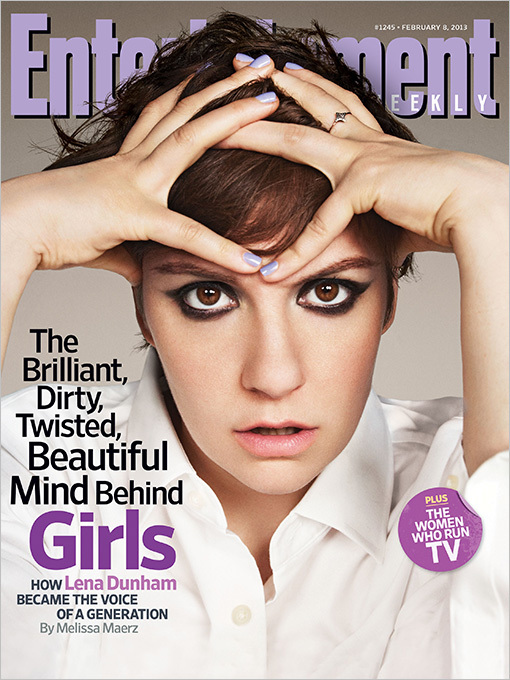 I just got my new ENTERTAINMENT WEEKLY, and found it really interesting that EW feels the need to emphasize Dunham as “beautiful” as part of the cover. I realize it’s technically qualifying “mind” (and not body), and “beautiful mind” is a saying that evokes a kind of wily genius, but I can’t help but feel that the fact that the font is larger, that we’re getting so much of her face right next to her descriptors, and that so much press has involved debating the meaning of her body, that EW is weighing in with its assessment of Dunham’s personal aesthetic value. And of course, it’s interesting that it has to be qualified, versus the many other women in entertainment it tends to have on its cover.